Just like apparel type, color, and pattern choices can accentuate favorable body parts, the choice in neckline can be used to deemphasize (or emphasize) various body parts. Here’s how to choose the right neckline for your body type and shape of body parts. 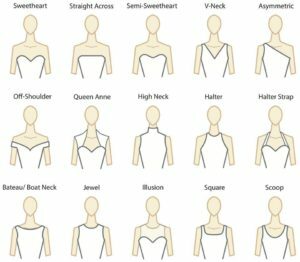 Note: Check out our complete encyclopedia of necklines here. Those with the common pear body shape (hip measurement is greater than your bust measurement) will desire to make the bottom look slenderer while adding the appearance of width to your top. To accomplish this, look for tops with collars and high necklines such as bateau, off-the-shoulder, jewel (shop jewel neckline tops), portrait, square, and boat neck necklines. Crew necks work especially well for small to medium size busts and long necks because they tend to draw the eyes to the face and shoulders. Heat shape body types (bust measurement is greater than your hips) will opt to make the top look more slender to balance things out. Tops with vertical lines and collars that elongate the top will be desirable. Shoot for V-neck (shop V-Neck tops), wrap tops, raglan, and collared button-down necklines. Avoid bateau, strapless, and spaghetti-strap tops. Evenly proportioned box body shapes (bust, waist, and hip measurements are all very close to the same) will want to add more shape to create a more curved silhouette while adding an indentation for the waist. You can add more shape with shirts that fit around the waist and necklines such as rounded scoop necks (shop scoop neck tops), peter pan collars, and wrapped blouses. Scoop necks in particular draw the eyes downward and lengthen the neck and work well for those with shorter necks. Hourglass body shapes (bust and hip measurements are about the same but waist is much smaller) have a wide variety of choices. All necklines look good on hourglass figures so focus on how your clothing fits instead (not too loose and not too tight). Halter necklines work well for hourglass figures with medium to full busts. Wider necklines offset the narrowness of a long face while a V-neck can make it appear even longer. Turtlenecks work great for long faces and thin necklines. Scoop necks also work great for long faces. Round or square faces can be made to appear longer with V-necks or square necklines. 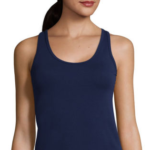 Scoop necks, sweetheart necks, square, and V-necks accentuate shorter necks by elongating the upper body. For those with thicker necks, a wider, deeper neckline extends the line of the neck making it appear slimmer. For those with long necks, crew necklines (shop crew neckline tops) can help shorten the neck but strapless necklines look great too. Narrow shoulders benefit from necklines such as off-the shoulder necklines that make the shoulder appear wider. A square neckline can also widen narrow shoulders and can balance a fuller midsection. Broader shoulders can benefit from a wider neckline by drawing the attention to the collarbone. Halter necklines also work good for those with wide shoulders. Smaller chests can pull off crew necks, V-necks, and scoop neck tops. Turtlenecks also work because small chested women benefit from a higher neckline. For those with larger busts, necklines that are too high make the breasts look saggy while necklines that are too low expose too much skin. V-necks strike the perfect balance. Thick or short torso types should look for more open necklines that draw the eyes upward toward the face. V-necks work well. For those with wider hips, boat necklines will help offset the appearance of wide hips since they follow the curve of the collarbone. 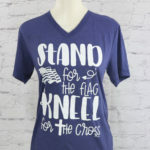 V-necks are a popular choice and for good reason – they look great on almost everyone. V-necks give a vertical impression to the outfit so pay attention to the depth of the neckline. Smaller busts should choose a less dramatic plunge while larger busts should look for a deeper V to elongate and balance the silhouette. For added touch, match the shape of the neckline with a necklace that mirrors the neckline’s shape. Off-the-shoulder necklines draw attention to the shoulders and work well for ladies with fuller midsections or those with perfect collar bones. Off-the-shoulder necklines look great with long pendant necklaces that add a lengthening effect.